We’ve gone down a path of believing that constant communication is always a positive. It might not be the case. 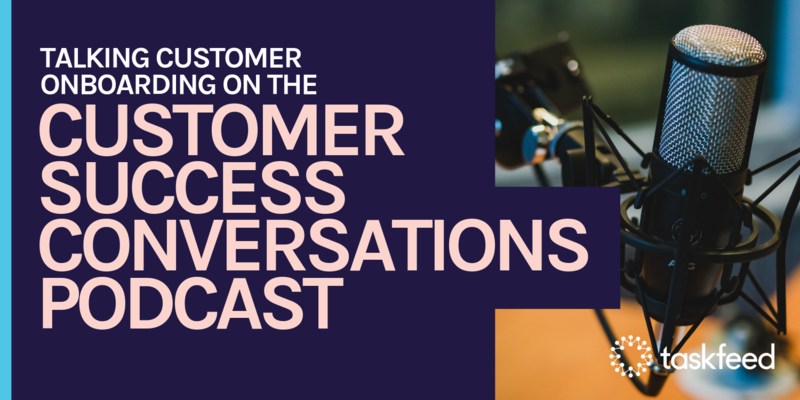 Which channels are working for businesses today in their effort to successfully onboard their customers and which ones are maxing us out without producing results? The rise of real-time business chat apps has been unstoppable. Messages stream between teams; decisions get made as groups collaborate on issues; no area is left undiscussed. The new speed of business is always on - this is how work gets done. Except it might be killing us, one line of chat at a time. If Slack is rapidly becoming the communication channel of choice in your business, you wouldn’t be alone. Somehow it seems to have slipped from niche tool into the mainstream without a proper conversation. We’ve seen it for ourselves at Taskfeed. Collaboration is what we do here, and the way in which we communicate is pretty much the beating heart of the onboarding business. We are always exploring new ways to work, new ways to share, communicate with our customers. As a remote team we use Slack, a lot. In fact, we basically don’t use email internally, just Slack. It’s followed a trajectory here that might seem quite familiar: At first, using the messaging app started out great but over time we began to realise it wasn’t all positives. The problem is that the format of these tools is actually driving the way we work. While the brevity and real-time nature of the format might seem like a welcome relief in a world awash with wordy emails, we are losing something valuable here..
We have no time to think. We are losing context. Are you experiencing a shift toward Slack in your workplace? It might be time to take a moment to consider how the tools you choose could be shaping the way you do business and whether you’ve got the right fit. But first of all, taking it back a step, it’s worth looking at the reasons why we fell out of love with email. Below we have an example of two conversations conveying the same message, but delivered in two entirely different ways..
See what I mean? Same message, but about 200 words difference. When you start a new email message, you are shown a 50-line compose window, not too dissimilar from creating a new Word document. Somehow this makes you feel like writing just a single line is wasteful. It appears to be human nature to fill all the available space, and it works that way with email too. If you are going to give me 50 lines for my message, I guess I should be using that, even when I don’t really have that much to say. In direct contrast, a messaging tool that presents the user with a one-line box to work in has already made a lot of decisions on your behalf about brevity. You no longer feel compelled to run through the social niceties and formal sign off that email seems to demand, and let’s face it, that’s a welcome relief. The outcome: same message, but a very different experience. No wonder we all thought Slack was the saviour. However, what we are starting to see is that brevity brings its own issues. It’s the nature of the real-time chat app that forces us to shoot from the hip. If we don’t provide a real-time response then we lose our chance, the messages scrolling ever upwards and quickly out of sight. So we respond, rapidly, and that message pings up on your colleague’s screens in real time. The expectation is that we get an immediate answer. So what happens if someone doesn’t respond - well, just ping them again. The problem is, that’s three pings just to get the answer to one question. There’s another issue here to consider - the person you really need to participate may not available. Your question is now wide open for anyone to jump on, whether or not they are the best person for the job. You have created a situation where the most available person gets to give their input, and then the moment has gone. That’s far from ideal. This is about expectations too, and responsibility. The rapid-fire style of the chat app effectively means that pretty much all of the context is left out by the sender, leaving the recipient racing to catch up in his own time. And to compound the problem, when the message gets caught in the chat crossfire of two threads happening simultaneously, the picture just gets even more challenging for the recipient. It’s this kind of low effort, low thinking approach on behalf of the sender that puts the burden onto the recipient. Of course, there are situations where Slack is the perfect tool - the times we are firefighting, swarming on an urgent issue or looking for a quick answer. But the fact that we are increasingly channelling all our communication this way has started to impact the way we work, and forcing us effectively into an all day meeting with no agenda. Slack’s too quick, too short, just too needy; email is just as demanding in other ways. So what’s the solution? Enter Chatter. Chatter is the “Social Network” within Salesforce that people like to poke fun at. It’s true, there are a number of challenges with Chatter. First off, its name gives the expectation of a chat app and its pitch, “Social network for the enterprise”, gives the impression it’s a place where people hang out and share photos of corporate away-days. If you can move past this however, you may find that Chatter is not instant messaging, but definitely not email. Compared to email and Slack, Chatter is designed for considered posts, not chats. Chatter provides formatting options, which is a subtle prompt that you are supposed to think about the composition of your message before sending it. As a result, your users tend to compose in the form of thoughtful, considered opinions. However, the real joy is that it does not demand the social graces of email - your post already has context as it is delivered within your Salesforce records. This is a good thing. What’s more, Chatter assumes that people will comment on a post, unlike the more free-form Slack which drops a chat in a channel, leaving it up to the reader if they reply in a thread or directly into the channel. So back to Taskfeed, what does this mean for us? For the moment we are still on Slack for everything internal and to some extent suffering. However, we are exploring alternatives to allow more considered, thoughtful and asynchronous discussion among a group. In terms of Customer Onboarding, we are moving to Chatter for effective collaboration with our customers. We like the way that Chatter allows us to share updates on a record and keeps a history for us in our CRM, where it belongs. 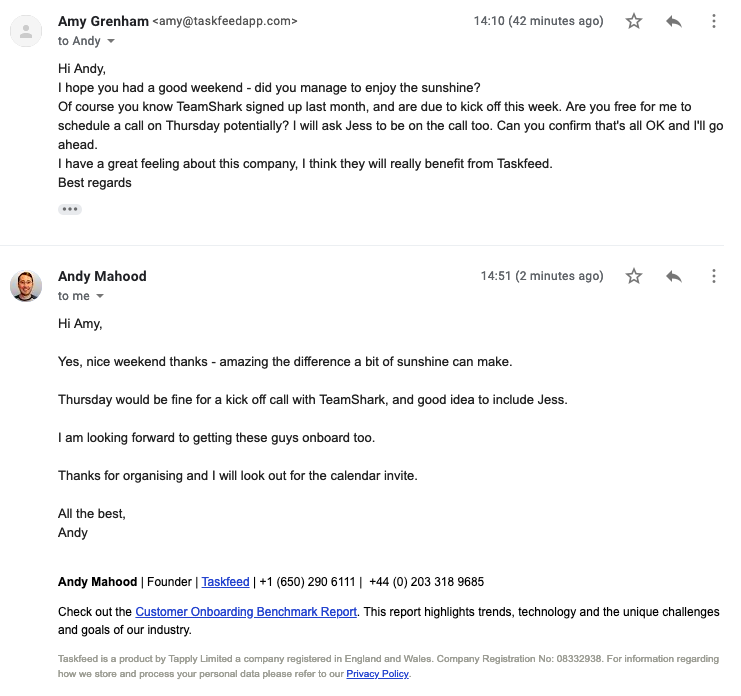 Because that’s the thing about Slack and email - they don’t play so well with Salesforce and actually, they don’t need to - when we already have great tools such as Chatter, Taskfeed and Salesforce Communities (watch out later this year as we bring some of this to market) isn’t it time we stopped having conversations elsewhere? That’s just our view, though. We’d love to know what your experience is. 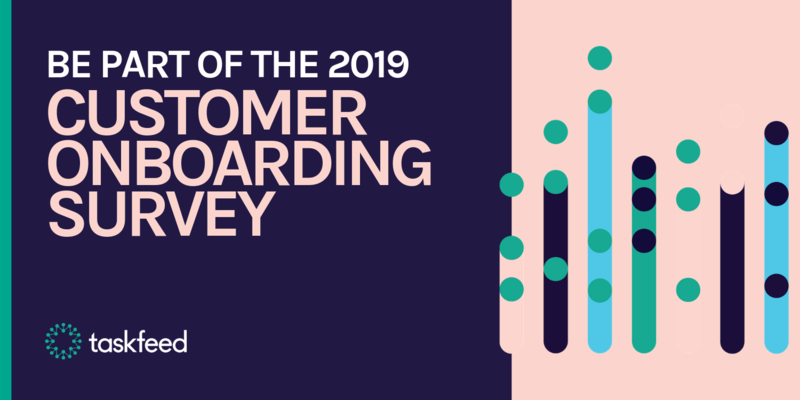 In our annual Customer Onboarding Survey, a core theme is to better understand how business are using tools like email, Slack and Chatter to deliver their onboarding to Customers. We fully expect to hear that despite its shortcomings, Slack is on the rise, while email is losing ground. However, we do suspect that as chat apps become more mainstream, there are many people out there, falling out of love with always-on-chat. Whether or not we will hit a crisis where people revolt in the same way they have with email, is another question. 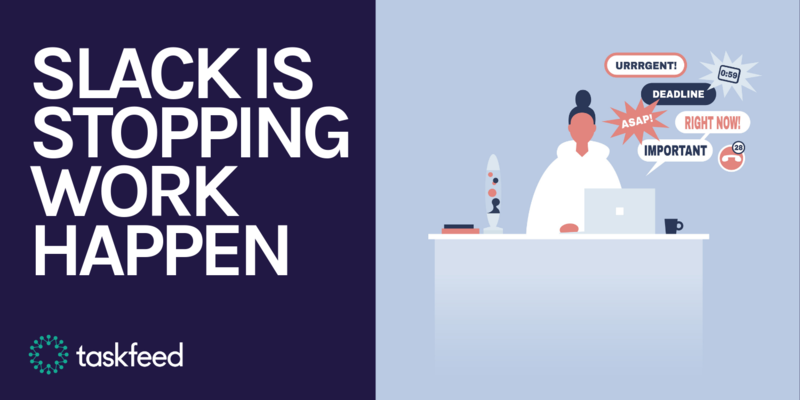 We’d love you to be a part of this and share how you work!